Hello Good Day,The next flagship from Samsung, Galaxy S8 is rumored to feature 6GB RAM and 256GB of internal storage. The phone is expected come in two variant 5inch and 5.5inch. So, Samsung Galaxy S8 Will be the Samsung’s next flagship handset. The upcoming device is expected to feature a major redesign. There are few rumors that suggest that Samsung Galaxy S8 is going for to be an all-screen device. The smartphone will lack physical home button and will have dual-lens rear camera setup just like iPhone 7 plus. Now, a new report supposedly lists some of the specifications of the upcoming device from Samsung, that is Samsung Galaxy S8. The reports suggest that Samsung is not done taking Inspiration from Apple. 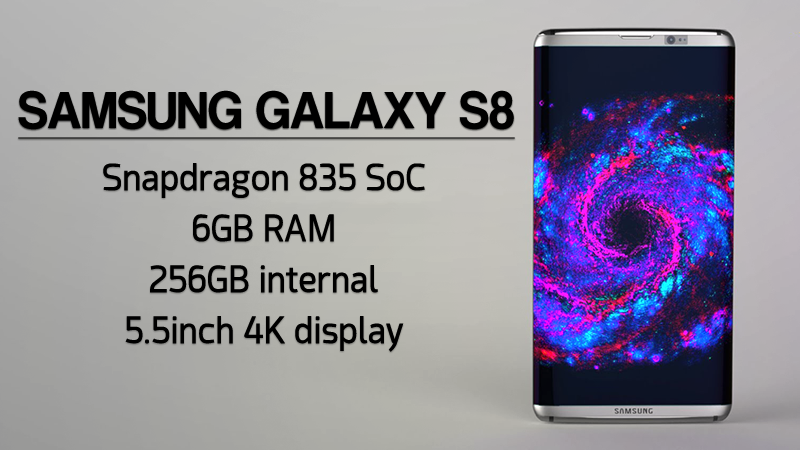 The latest reports suggest that Samsung Galaxy S8 will adopt Qualcomm Snapdragon 835 SoC paired with 6GB RAM and 256 GB Internal storage. The company is also expected to use their own Exynos 9 series chip for European and other markets. Further reports also suggest that the smartphone Samsung Galaxy S8 is expected to pack a 4,200mAh battery and will integrate Quick charge 4.0 for fast charging. Samsung Galaxy S8 is expected to sport a curved 5.1 inch 2K Super AMOLED display and the larger variant will have a 5.5 Inch 4K Display.